Choosing the right MLCC for your automotive application involves researching specifications, certifications, pricing and availability, and many other considerations. High Voltage: EV systems are based on high-voltage battery systems, so capacitors must be rated for increased ranges such as 250V to 400V for plug-in hybrid electric vehicles (PHEVs), 800V for commercial vehicles, and 48V for hybrid electric vehicles (HEVs). High Power: In order to complete with combustion engine petroleum-based vehicles that are refilled within minutes, companies are focusing on ultra-fast charging solutions, including EV systems that can handle increasing amounts of power (greater than 3.3kW) and charge directly from the grid. Reduction in Size: The vehicle’s size and weight will affect its overall energy efficiency, so footprint reduction for EV subsystems (and the components they use) is a priority. 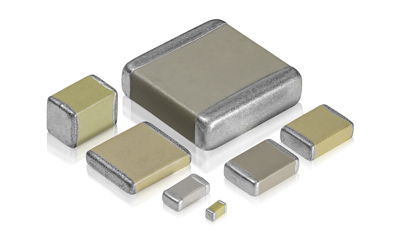 Capacitors must therefore provide the same high performance within smaller dimensions. High Temperature: By pushing the boundaries with increased voltages, higher converter frequencies, and smaller footprints as mentioned above, all of these factors combine to create a high temperature environment that can be inhospitable to standard parts. Components must be rated to withstand and smoothly perform in those conditions. Industrial Reliability: Automotive-grade capacitors are designed to meet stringent standards of robustness, and special features have been developed for the most demanding applications that require increased reliability and superior mechanical performance. 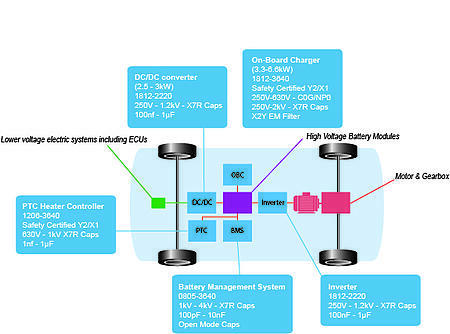 To get the full details, read our white paper, "Considerations for Selecting Automotive-Grade Multilayer Ceramic Capacitors in Electric Vehicles", that discusses common MLCC use cases in EV subsystems and capacitor requirements for specific applications.